HE is NEW and will work to help you out. Still in a really hard transition....you will need lots of patients ...thanks...NEW PARTS .... SEE BELOW.. Sorry that we missed your phone call. We’ve been in the process of moving but are now able to supply the parts you need. 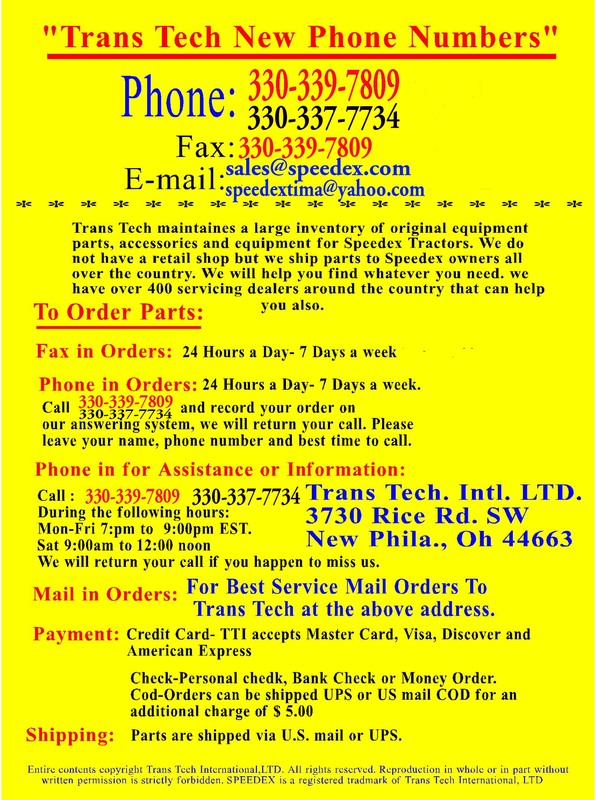 For best service on your SPEEDEX® parts order we have enclosed an Order Form. Please fill it out for the parts that you want to order and mail it to the address above. We will let you know the prices so that you can send a check or know the amount before we process your credit card. If you have a Parts Manual fill in the Part Nos. and part description. The Part No. is a 7 or 8 digit number, not the 1 or 2 digit number from the diagram. If you can’t figure out the Part No. just give a description and we will help figure it out. If you do not have a Parts Manual we have them available for $5.00 each (plus $1.50 shipping). Just need to know the Model No. of your tractor. If you don’t know the Model No. of your tractor we can help you figure it out. On most models there was a decal on the hood for the Model No. The Model No.’s are like S-14, S-19, S-24, 1030, 1630, 1632, 1040, 1240, 1640, etc. SPEEDEX® made about 75 different models of tractors. 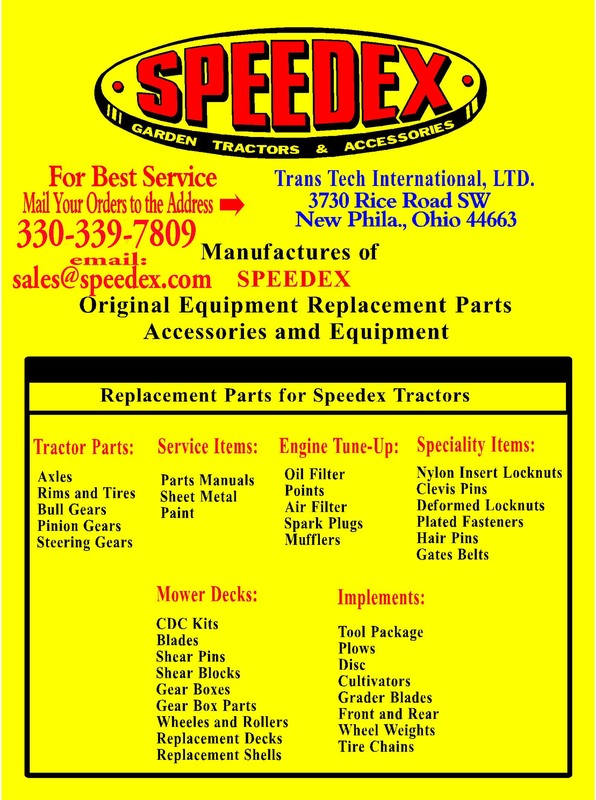 Again, we’re sorry for any inconvenience this may have caused but we will do our best to get you the parts you need to keep your SPEEDEX® in top condition.